How To Get Android Oreo Features On Any Device - AndroGuider | One Stop For The Techy You! Android Oreo was launched back in August 2017, marking itself the most anticipated Android version yet. Not only does it bring some sweet interface changes, but also offers some major internal changes to make the overall Android experience better. 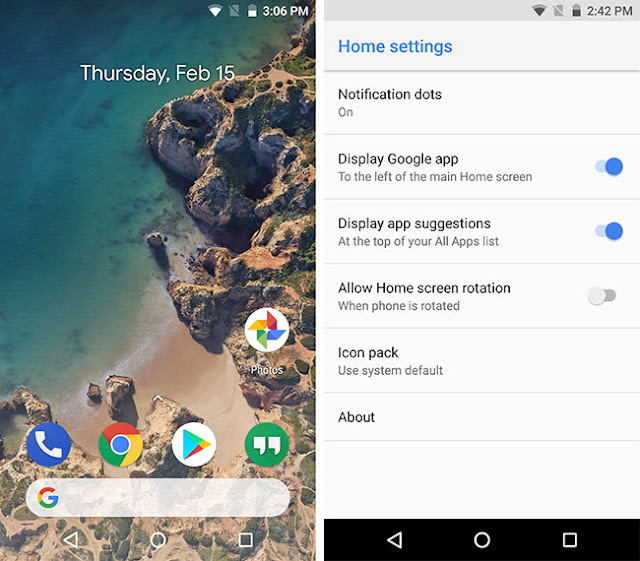 Some of the major highlights include Picture-in-Picture mode, notification channels, background limits, revamped Settings, new launcher features, and more. With luring new features, every Android user would like to get their hands on the fresh new OS version. Manufacturers seem to be working hard to release the update to its supported devices. But that would take time, a few months at least. Others having older devices, may not even have the chance to see the update. Irrespective of those, Android users can still take advantage of a few apps and mods that could help them enjoy some Oreo-exclusive features. Despite the availability of a large number of Oreo-based custom ROMs, people often look forward to easier ways to experience the Android Oreo features on their phone. Well, we'd be lying if we told you that it's really not possible. Each pointer below represents a different Oreo feature and the way to get it on your phone. Android Oreo brings a lot concerning the Notifications. It now offers a cleaner material-style interface and Quick Settings panel. The difference from Nougat to Oreo itself is quite drastic. In order to achieve the same on your phone, you can use the Material Notification Shade application. It is a full-fledged app that mimics the complete Oreo-style notifications and Quick Settings toggle on your Android device running Lollipop 5.0+. Download the application for free from the Google Play Store. Once installed, launch the app from the app drawer. Turn ON the toggle on the top of the app's main screen. As you do it, you will be prompted to grant the required permissions. So, toggle ON each option one after the other and follow the on-screen instructions. After allowing the permissions, return to the main screen. MNS service should be enabled now. Scroll down the notification shade to confirm that the UI looks like that on Oreo. Apart from that, the app also offers a series of customization options for DIY enthusiasts. For example, you can manually select notification panel colors, choose a background image, apply a different profile picture in QS panel, and much more. One of the most talked-of feature in Oreo is the Picture-in-Picture mode. The feature was initially introduced in Nougat for the Android TV interface. Considering the usability and functionality it offers, Google decided to implement the same for smartphones as well. PiP intuitively pushes an on-going video content window like videos or calls into a floating window. The window can be moved freely to any location on the screen. The feature allows you to perform different tasks like using apps, writing documents, and more, all while consecutively playing the video on the screen. Thanks to the infamous VLC media player, you can now get Picture-in-Picture mode on any Android phone. To launch a video in the dedicated mode, just follow the simple steps below. Download and install ‘VLC for Android’ (Play Store | APK) on your Android phone. Navigate through your files and play the video of your choice. In the video player window, tap on the 3-dot icon in the control panel at the bottom. Simply tap on the pop-up window. You will be asked to enable 'Draw over other apps' permission. Enable it. The window will automatically be pushed to the bottom-end of the phone’s screen. You can press and hold on the window and drag it around any way you want to. You can also tap on the pop-up window at any time to bring up the controls or expand it back to full-screen. Easy, right? The appreciation goes to the VLC developers from implementing this efficient player and allowing users with any Android version to use it. The infamous Pixel 2 Launcher paired with Oreo provides one of the most polished launcher experience. However, many features including Adaptive icons, Notification Dots, and bottom search bar strictly rely on the latest Oreo APIs. Fortunately, the development community is no short of talented people. 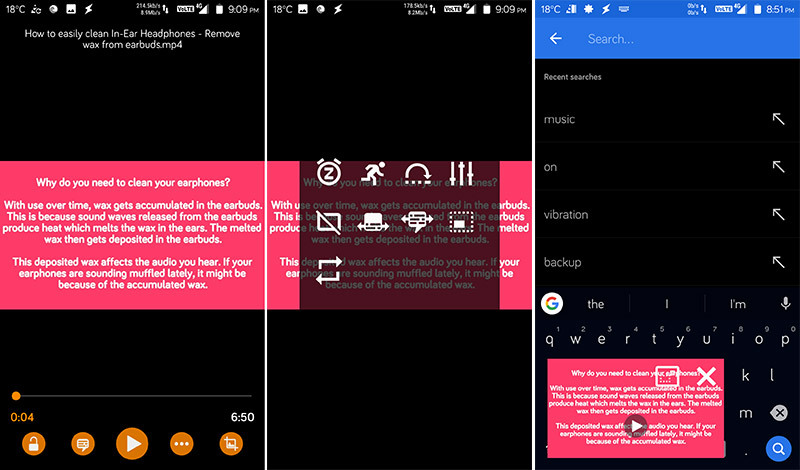 Redditor AmirZ has taken a step forward and carefully backported the said features for Android devices running Android Lollipop 5.0 or above. Swipe left on homescreen to access Google Now feed. 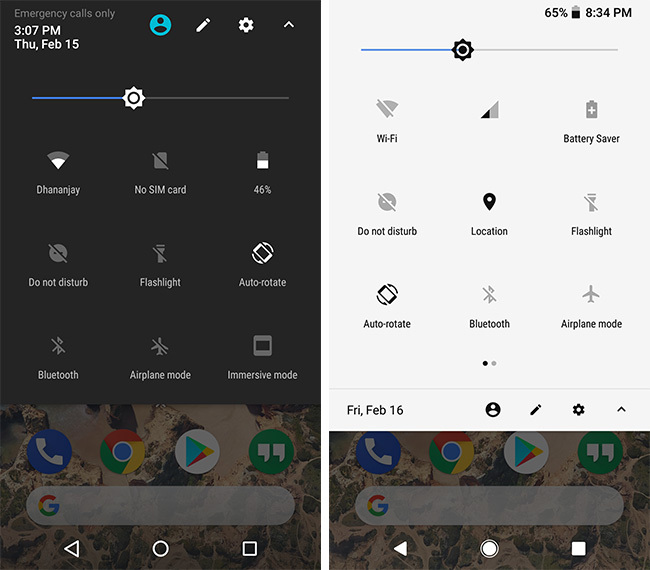 Pixel 2-like 'At a Glance' widget to display date, events, and weather. The best part about this launcher is that you wouldn't need root or any other system modifications to use it. All you have to do is, download Rootless Pixel 2 Launcher APK and manually install it on your Android device. If you would like even more customization, you can try out third party launchers like Nova or Action. Lawnchair is another good alternative. Apart from the complete OS update and new features, Google also pushed its own apps in compliance with the latest API. Indeed, some of these apps also presented new features. We have gathered the APKs of all the updated Google apps for you to install. All the APK files linked below are sourced from APKMirror. You may find an app in different variants on APKMirror. To know on which APK file you should download, refer to APKMirror's FAQ here. All you got to do is grab the latest APK for the corresponding app from the above links and manually install it on your phone using a file manager. To get the best experience, set each of the apps as defaults for their respective functionality. For example, set Google Phone as the default "Phone app". To set an app as default, go to Settings > Apps, tap on the gear icon and configure the default apps from therein. If you are using skinned version of Android, that is something other than stock Android, then you may have to do some work in finding how to configure default apps. We would recommend using the search option in the Settings menu and searching for "default". 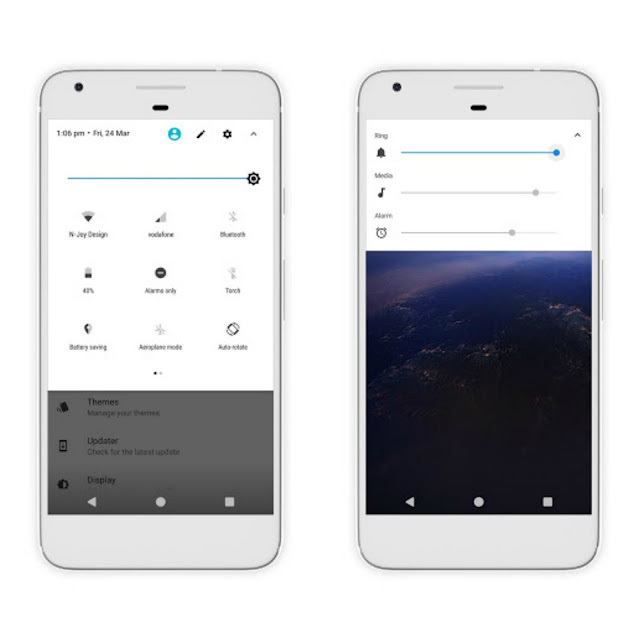 For devices with on-screen navigation, the Oreo-like NavBar could add the final touch to the overall transformation. This could be easily done on your device without root, by using an app called "Pixel Navigation Bar (No root)". The app could work on non-rooted devices and doesn't need any special permissions. All you gotta do is download and install Pixel Navigation Bar (No Root) app from the Play Store. Once it is installed, run the app from the app drawer. Upon opening the app, you shall see a minimal interface with the toggle on the top of the app screen. Simply switch ON the toggle to enable Pixel-like NavBar on your Android device. 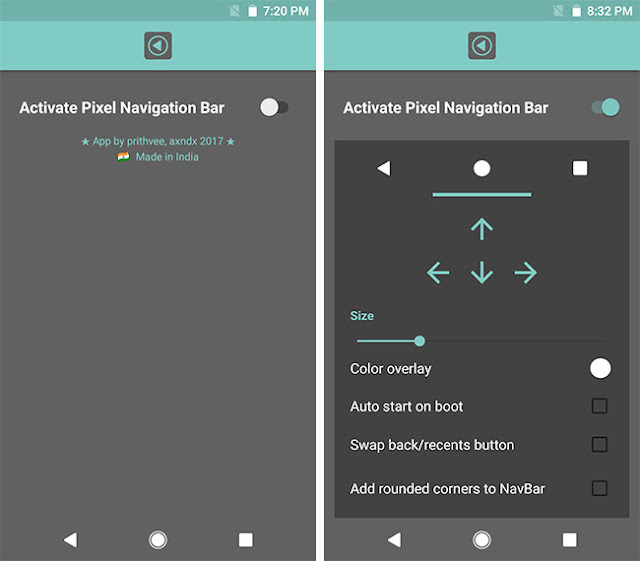 Once enabled, the app also provides the option to customize overlay color, auto-start the app on boot, swap back/recents button, and even add rounded NavBar edges. This mod is meant for rooted Android phones. Android O-ify is a successor to the infamous Android N-ify Xposed module. 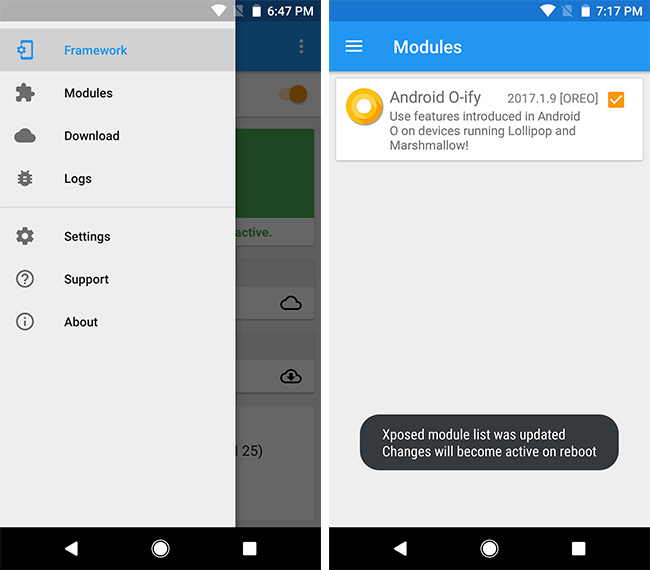 And as the name suggests, the module focuses on completely revamping your phone's interface to that of Android Oreo. It only supports Lollipop and Marshmallow at the moment. Installing the module on Nougat-running phones will most likely fail. The list of Oreo makeovers that Android O-ify offers include - Oreo color accents, revamped settings app, new system colors, Android 8.0 easter egg and new lockscreen style. According to the official statement from the developer, he is working on releasing an update with added features and support Nougat as well. If you have a rooted phone, then the process is pretty straight, all you have to do is install and activate the module. You must first install Xposed Framework on your phone. Once it is properly set up, download the Android O-ify module APK. Use a file manager to install the module on your device. After the module has been installed, open the 'Xposed Installer' app. Tap on the menu icon and open the 'Modules' section. Just tap on the checkbox next to the module name. Finally, reboot your phone for the changes to take effect. 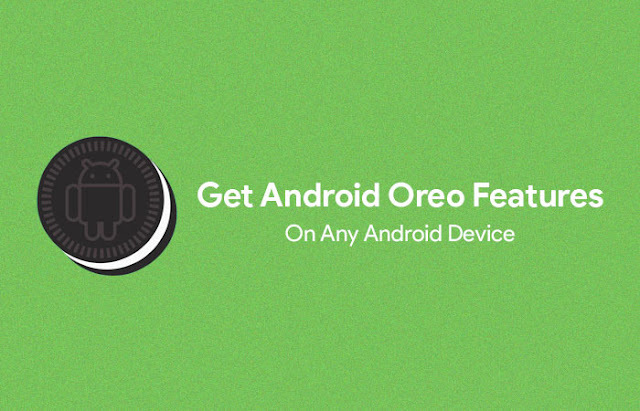 Once your Android device boots, you shall be presented with the visual Oreo features right on the screen. Easy, right? The Google Pixel 2 has a bunch of beautiful live wallpapers. 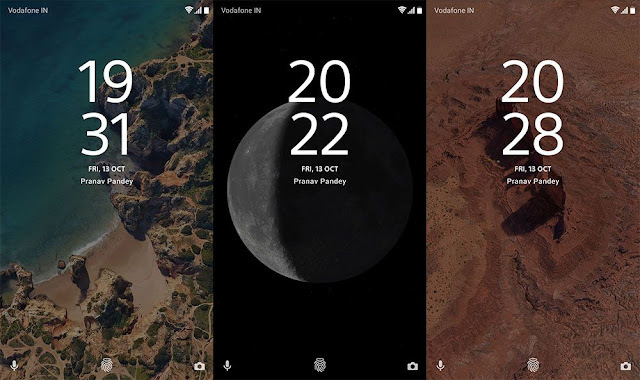 Thanks to the work of developer Pranav Pandey, you can get Pixel 2's live wallpapers on any Android device running Marshmallow or higher. Since there are chances that Pandey might update the port of his wallpapers in the future, we are not sharing any download links of Pandey's work. We would instead advise you to read the detailed post Pandey has published on the XDA forums. You will be able to find the download links in the XDA forum post. The most anticipated internal change in Oreo was the inclusion of OMS (Overlay Management System). Android users can now make use of the feature to enable system-wide theme support. This is done by using the Substratum theme engine. Unfortunately for users running Android version lower than Oreo will need root for this to work or a custom ROM that supports OMS. 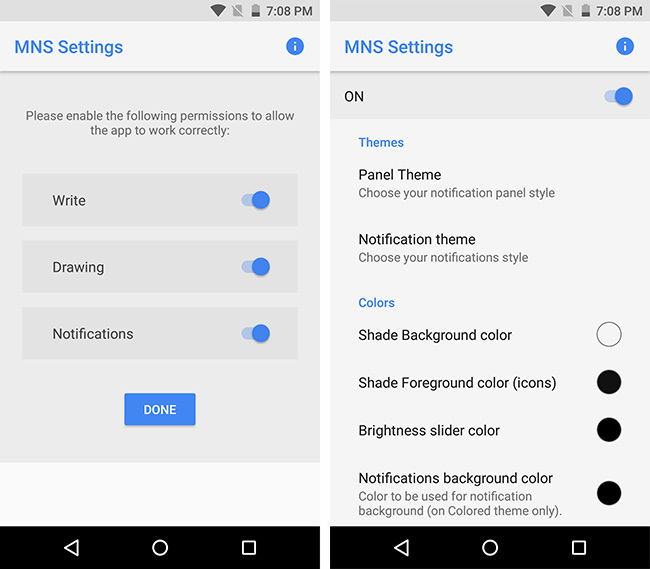 For AOSP Nougat based custom ROM users, there's a plenty of Substratum themes available on the Play Store that can help you get Android Oreo features in terms of the visual appearance. We have picked the one most popular among the users. 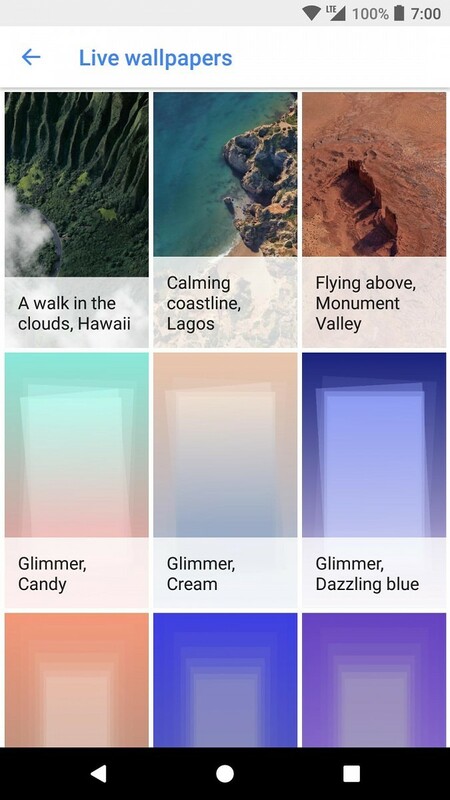 "Android O" is a paid theme on the Play Store and was last updated on November 14, 2017. Apart from theming the SytemUI, the theme also modifies the looks of applications like Google Keep, Hangouts, YouTube. A Substratum theme has to be updated regularly so that it can theme updated versions of applications. Since the theme hasn't been updated in a while, you will get errors when attempting to theme latest versions of the aforementioned applications. If you think you would be satisfied by theming only certain components of your device, you can go ahead and buy the theme. Please note that this theme will only run on Nougat ROMs that are based off AOSP. Highly skinned versions of Android like MIUI, Experience won't be able to make use of this theme. If you have a Samsung device running Nougat, check out the Oreo theme on the Galaxy Theme store. MIUI users can check out the "Pixel Oreo" theme here. Download and install Substratum and Android Oreo theme on your Android device. Once installed, launch Substratum theme engine from the app drawer. Tap on the Android Oreo theme overlay on the default screen (Themes). Turn ON the "Select to toggle all overlays" toggle. Tap on the round icon on the bottom-right of the screen. Once the overlays are compiled and install, the interface will automatically relaunch with the new theme. You can also set the bootanimation, font and wallpapers to that of Oreo from the respective headers. It is recommended to reboot your device for the changes to take effect completely. Android Oreo brings a series of features that every smartphone user looks forward to. Unfortunately, not every one of us will get the update after all. But these simple apps and a few mods can get you almost every feature. So these were our tips on how to get Android Oreo features on any Android phone. If you have a suggestion regarding an app or a mod that could serve the purpose, then let us know by commenting below.